1. Preheat the oven to gas mark 3/170C. Grease and line a 23cm springform tin. Mix the milk and vinegar together and set aside. 2. Make sure all your remaining ingredients are at room temperature if you can, but since no one's going to be overly worried about the cake, you shouldn't be either. If the ingredients are cold, the worst that can happen is that the cake will be heavy. But you do need soft butter (or the cake won't mix), so substitute marge if that's not a goer. Put everything for the cake, except the vinegary milk, into a food processor and blitz to mix. Remove the lid, scrape down with a rubber spatula and then put the lid back on and with the motor running, add the vinegary milk. 3. Scrape, spoon or pour the brown batter into the tin and spread to fill it evenly, baking it for 40-45 minutes until it is well risen and springy to the touch. 4. Remove the cooked cake, in its tin, to a rack and leave to cool for about ten minutes, then spring open the tin and let the cake get completely cold. 5. To make the icing, first sieve the icing sugar. Boring, but it's got to be done. Melt the butter in a saucepan and when it's bubbling add the cocoa. Let it dissolve into the butter, stirring with a little hand whisk, then add the syrup, milk, vanilla and colour paste. Stir or whisk well and let it bubble for a few minutes and then take the pan off the heat and whisk in the icing sugar. 6. Put the pan back on the heat and whisk again to help the sugar dissolve and the colouring disperse, then take it off the heat to let it thicken to the right consistency - thick enough to coat, but thin enough to trickle down to cover the sides too - as it cools slightly (but only slightly: it thickens fast). Put the cake on torn-off pieces of baking parchment to form an outline of a square to catch the excess icing. Place the cake just on top of the torn pieces of parchment so you can pull them away once the icing has stopped dripping. Hold the pan of icing over the centre of the cake and pour over it so that the top is covered and the icing has dripped over and down the sides. You will not believe the incredible blackness of this. You'd have to pay me to eat it (good though it tastes) but my children, and all the children I've made it for, can't get enough. You can imagine what their mouths look like afterwards. 7. Working quickly, throw over the black sugar sprinkles to cover the top and sides of the cake before the icing dries. 8. 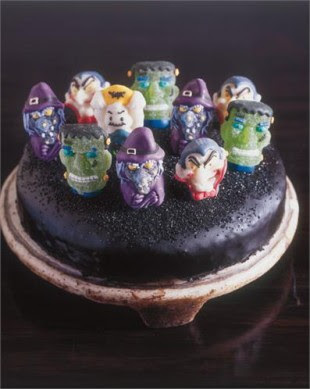 Trim the lolly sticks, so that you have a stem of about 3-4cm to stick into the cake, and then plunge the sticks of the foreshortened lollies into the cake so that the ghoulish faces leer out from their black-frosted graveyard. 9. To be honest, this cakes serves as many children as you can stick lollies in for, if that makes sense. You could certainly find room for 12.